This Mossimo Long and Lean tank is essential. It’s from Target and only $9! Get a couple! Eileen Fisher Classic Collar Organic Cotton shirt. A bit pricey but you can wear this all year a million different ways. Great quality too! This Gap Shrunken boyfriend shirt is awesome; it runs small though so order one size up. Petite Modern Skinny Ankle Zip jeans. I have these, so comfy and great price. I always wear the 3″ Chinos from J Crew. They are on sale right now!!! Go get them!! 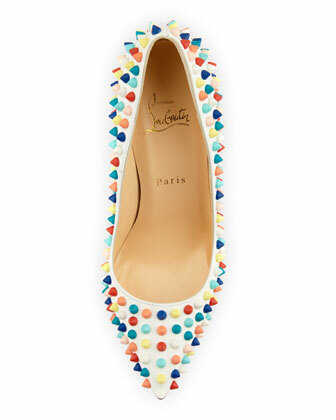 I’m going to leave you with the Christian Louboutin Pigalle Spikes pump…… The big guy thinks I’m crazy for obsessing over these but honestly, they make me weep. LOVE! This entry was posted in Style and tagged gap, j crew, louboutin, nordstrom, shirt dress. The Best Sippy Cup Ever. Seriously. That nifty weight at the end of the straw allows for the straw to follow the milk (or juice etc) around no matter how Squeaker is holding it. Don’t be fooled by other brands that look like they have the same thing, the straws on some of the other brands are too stiff and don’t work. I hope you enjoy! What are some of your genius baby finds? oh and honestly…… can you handle the cute? I for one, can not…. This entry was posted in Life & Travel, Mommy Thangs and tagged best baby products, mom blog, nordstrom, sippy cups, Target, the best sippy cup, ZoLi.